Home/Blog/ Marketing, Strategy, Video/Is It Enough To Have One Video For Your Marketing Strategy? Is It Enough To Have One Video For Your Marketing Strategy? It’s very smart to use video. In fact, it’s probably the smartest thing that you can do to improve your online marketing strategy. Video content is powerful and engaging, and it’s one of the best marketing tools you can use. But when you’ve created one video, then what? Is it over? Well, no. In fact, having just one video can set you back. You should see video content as the backbone of your marketing strategy: and for it to work correctly, it needs to be very strong. The only way to do this is by having more than just one video – in fact, the more the merrier! Different types of video content work to satisfy the needs of your leads. These needs vary, because your leads will have different questions and problems on the road to becoming your customers. One video alone won’t be able to satisfy all of these changing needs. What you need are different types of videos that will help your customers for every step of the road. But first, you need to know the path they’ll be taking! Let’s talk about inbound marketing and the buyer’s journey. A great video marketing strategy is based on inbound marketing. Basically, inbound marketing is all about making your customers come to you, instead of going out there and getting them. The secret to attracting people is by providing valuable information – the kind of content they need. You see? It’s not enough to have just one video, and if you want your videos to shine, you need to learn how to use them at the right moment. This means that you need to know your target audience like you know yourself. If you understand their pain points, then you can trace their buyer’s journey – and you’ll know exactly which videos you can use to help them move forward… all the way to the purchase phase. Let’s take a look at the different videos you can use, and in which part of the buyer’s journey they’ll work the best. 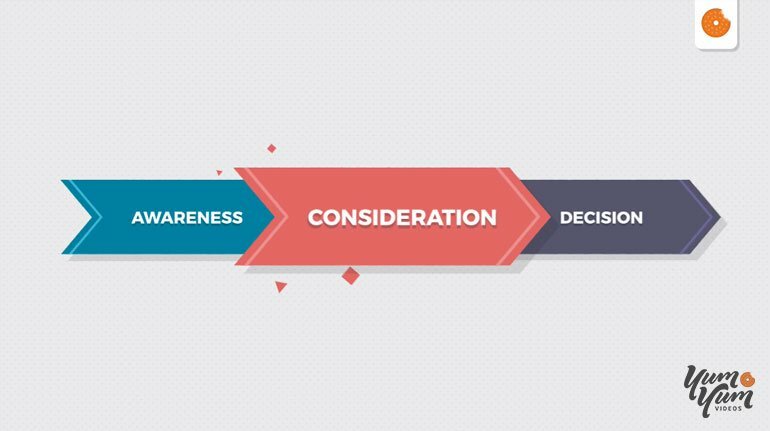 During your buyer’s journey, your future customers will go through three main stages: awareness, consideration and decision. Each one of these stages requires specific types of content, because in each one of them, your audience will have specific needs and they expect you to meet them. Let’s go through the different types of video content that you can use for each stage. During the first stage of the journey, your audience is starting to realize that they’ve got a problem in need of a solution. Your job? To provide information that helps them understand their problems. Also, keep in mind that this is probably the first contact between your audience and your brand! So you must give the best first impression. People love to learn new things, and what’s even more important: they love to share informative content with their peers. Educational videos take that power and turn it into a very useful tool for the awareness stage of the buyer’s journey. During this stage, your audience is looking for information, and there you are, ready to provide all the answers! Do you want to make a great first impression on your audience? Then commercial ads are your way to go. These videos will share your brand’s spirit and beliefs with your audience, and the most important thing – they’ll keep them wanting to know more about you! The middle stage of the buyer’s journey is defined by research. Your audience is now aware of their needs, and they’re actively looking for solutions. Now, your job is to provide information about these solutions, and explain why the solution you’re offering is the best one. 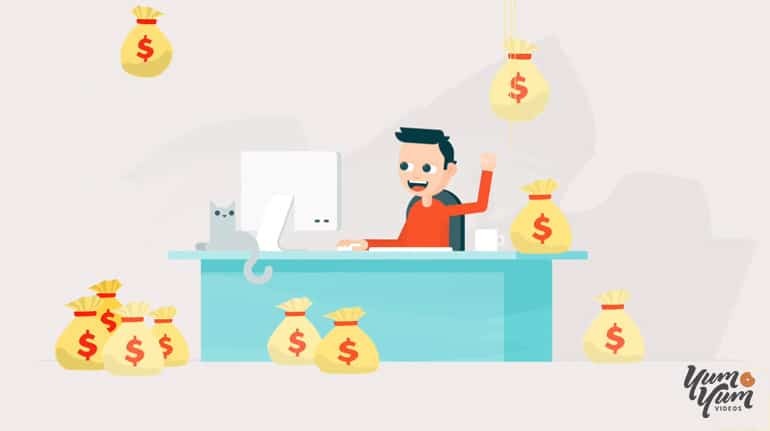 An explainer video is a short, powerful piece of content that will simplify the complex details of your company for your audience. Basically, it informs your audience all about your brand, your product and how it improves your customers’ lives – and it does it all in 90 seconds or less! Because of this synthesis power, marketers love explainer videos. It’s the type of video content that explains the highest amount of information in the shortest amount of time. They come in a lot of different styles, too. Whiteboard videos, motion graphic videos, cartoon animation… You just have to choose the one that fits better with your brand! During the consideration stage, your audience is also looking for information – they need to know more about the different ways to solve their problems. With “How-To” videos, you’re giving them all the information they need about it! Teach them how to solve their problems by using your product. There is nothing more useful than a product video to show your audience how great your products are. Basically, product videos show your product in action – and this really encourages prospects to convert! It’s showtime! The moment in which your prospects will actually make the purchase decision. Right now, they’re looking at their options: are they going to choose you? Or will they prefer your competitor’s product? If you want them to choose you, your video content should inspire brand trust. Give them solid reasons to trust you, and to believe that your product and your brand are superior to any other. Testimonials are great to build brand trust: customers trust their peers. And if they watch the stories of people just like them, solving their problems with your product, they’ll trust them… and they’ll trust you. There are a lot of things to keep in mind in order to make a great testimonial video, but remember this: your customers must provide real and natural answers to every question. Skip scripts, let them use their own words: you want their emotions and expressions to really shine through the screen… this will create a real connection with your prospects. If you want tips on how to create a great testimonial video, take a look at the free guide we made about it! Another way to build brand trust is by using company story videos. Also called “About Us Videos”, this kind of content shows the real story behind your brand. It’s like a peek behind the scenes, a way to introduce the real people on your team: the faces and the stories behind your brand. Share your company’s story. Be authentic, real: show your future customers why your team is the best. Your audience will be thrilled to know the human side of your brand, and they’ll trust you completely. Now it’s your turn to choose the best types of videos for your marketing strategy! Remember, it’s not enough to have just one video – but it’s also not enough to have many poor-quality videos. If you want your videos to actually work, you need to keep the highest quality possible. Yes, you need many different videos! But these videos have to keep the highest quality standards. Also, your videos need to be fully customized in order to work. A generic video will never set you apart from the rest – your brand is the best one out there, and your videos have to communicate that. Your videos need to communicate your brand in every single frame. They must be created to fill the specific needs of your target audience, and this is why they need to be 100% customized! But it’s also why you’ve got to know your audience like the back of your hand. So do your homework, and research your target audience: their needs, every single one of their pain points, and each step they take during the buyer’s journey. Only then you’ll be able to craft a smart video marketing strategy, powerful enough to guide your prospects into becoming loyal customers! At Yum Yum Videos, we know all about the power of high-quality video content to boost sales. We work with the best team of script writers, illustrators, animators and voice actors to deliver a completely customized job, every time. If you need any help, contact us! We’ll be happy to help you boost your marketing strategy with high-quality video content.